We left beautiful Tofino and Vancouver island, cross the Strait of Georgia by boat and came back to the big city Vancouver. Vancouver has a quarter where all ramen shops and other Asian food concentrate and it seems to be competitive to survive there. For us it is heaven and we ate our ramen to our content! After having satisfied our appetite, we walked to the Second Beach. A lot of locals were out there taking a walk, biking, rollerblading and simply enjoying beautiful warm evening. Some musicians were playing music and it was a great atmosphere. May the sculpture inspire laughter, joy and playfulness in all who experience it. Coming from the country of hot springs (“onsen” in Japanese) and being an onsen addict, I visited countless hot springs in my life. Sometimes I hiked into the mountains for a couple of hours to soak in one. Philippe joined me with this onsen-hopping passion. A memorable one was the running river hot springs in Iceland we visited with Lia and Luca. But today’s hot springs, Hot Springs Cove in Maquinna Provincial Park, is the remotest ever and only accessible by boat or plane! It takes us a 1.5 hour boat ride and a 2km boardwalk hike to reach the hot spring at the shore of Openit Peninsula. I hesitated to go for this trip because I get easily sea-sick. My worst boat experience in Greece years ago still lingers somewhere in my mind. However, Philippe talked me into this trip with the view of soaking in hot water in a beautiful setting. The morning weather was great and the sea was calm. We got on the boat and it started sailing smoothly from the Tofino Harbour along countless small forested islands and remote white beaches. Only occasionally a few kayakers or campers were on the beaches. Otherwise the area is complete wilderness. Soon we spotted a bear on the beach which were flipping rocks to search food! Only a few hundred meters away some kayakers had their tent pitched. Neither the bear nor the kayakers seemed worried much. We however were happy to watch it from the safety of the boat. Soon we spotted another bear and several otters swimming and we were all excited. One hour and half after leaving Tofino the boat dropped us at the hot spring’s pier from which we walked 2km to the springs. Direct access would not have been possible due to rocky cliffs. After walking through the beautiful dense cedar forest for half an hour, we saw the steam and smelled the sulfur. This steamy water turning into a small waterfall, creating pools here and there. As our boat was the first one to arrive, there were only a couple of people. After hopping on the rocks and dipping into a couple of pools to test the temperature, we each settled into a small pool just big enough for one person. The temperature was little below 40°C – perfetto. Spending five hours soaking, exploring the area, enjoying the view and lying around on a small pebble beach, it was time to go back, this time, by float-plane. Philippe got all excited after we let some slightly impatient travelers get on the first plane and in return got the 4 seater floatplane all for ourselves 🙂 Just us and a pilot – but Philippe thought the pilot was overkill. He would have flown that thing himself (of course, my hero). Stunning views from the sky. And as a premium, we saw a mother whale and her calve very close to the shore. We have not done any kayaking in Canada. It seems that kayaking is a very important part of Canadian lifestyle. 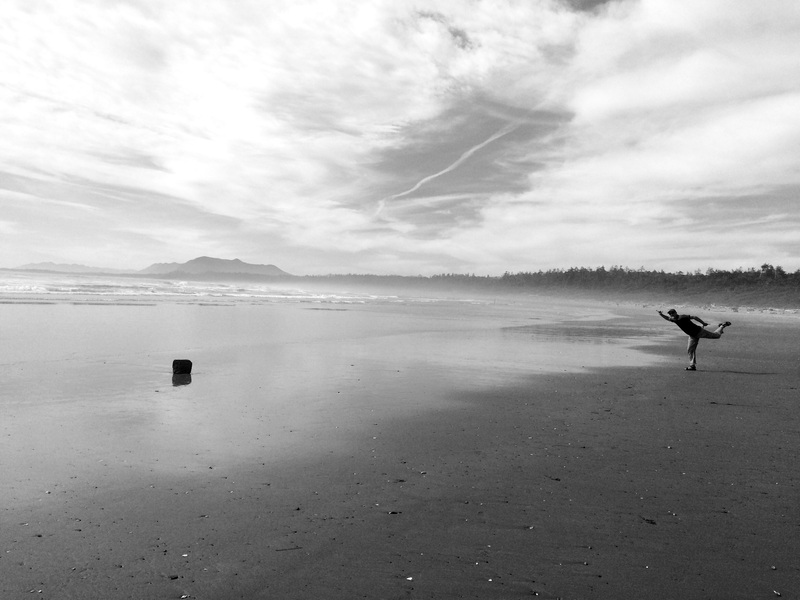 It also looked like fun to explore an intricate Tofino coastline with many islands and inlets from the water level. We do rowing in the Swiss lakes back home but we have done kayaking only once in Norway. So today Philippe said, “we should do kayaking in Canada.” Then we signed up for an evening tour from 7 pm so we could enjoy the sunset while paddling. One of the most spectacular sunset we have ever seen! The color of the sky and clouds were changing and we stood there in awe. Al from Archipelago Cruise mentioned to us about the Japanese-Canadians in Ucluelet and pointed out the place of their village during our cruise trip. 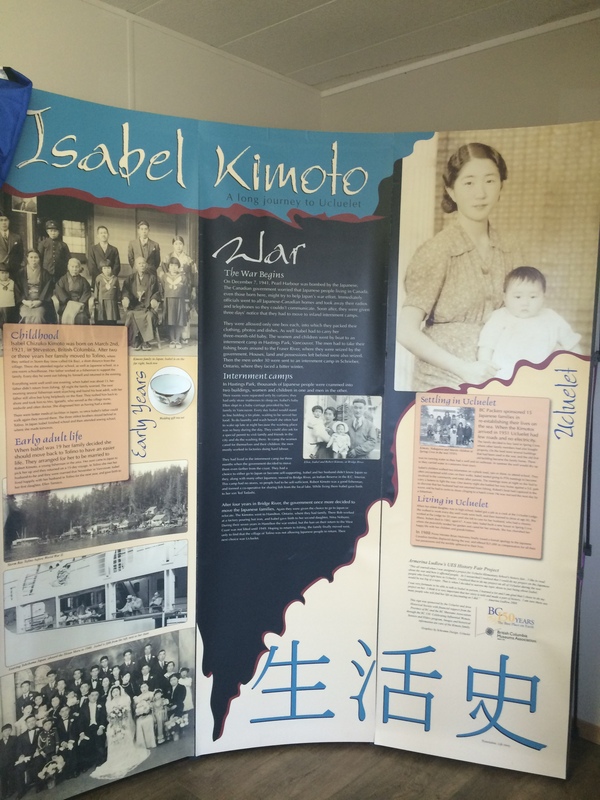 I wanted to find out more about them so the next day we went to the Ucluelet Information Center which had a small stand describing the history of Isabel Kimoto and her family. Apparently there was a large community of Japanese fishermen and their families in Ucluelet before the war. However, after the Pearl Harbour Attack, the Canadian authorities considered all Japanese-Canadians as “enemy aliens”, seized their houses and boats, and took them to an internment camp in the Rockies. After the war they could move to Ucluelet and there are still some Japanese-Canadians living in the town. I learned another piece of this sad history after visiting the Nikkei Memorial Center in New Denver earlier. This morning we joined a guided walk on the Wild Pacific Trail, “Survival on the Edge”, organized by the Central West Coast Forest Society. A young, friendly Canadian, Taylor, who is studying resource management gave us a very instructive 1-hour tour of the coastal old growth rainforest of Ucluelet, the Lighthouse Loop. The old growth forest in this area is magnificent due to the yearly rainfall of 3.5m. Gigantic trees spread angular branches (sometimes with 90 degree angles!) to get the maximum sun. Their twisted branches are like arms and they call them “witch’s bloom” (many branches are spread out like bloom). It looks as if the branches were shouting out for sun! These trees live under harsh environment. Their branches are blown by fierce wind. This area is famous for wild storms and the coast in the area was called “the Graveyard of the Pacific”. There are apparently 500+ shipwrecks under the waters. The trees on the coast are surviving these fierce wind and storm, “surviving on the edge”. The fallen trees, are also vital to this forest. They become “nurse logs” to help insects and other plants to grow on them. With years they decay, rot and become soil. When the trees fall, it creates more space and bring sun to the forest floor to help new plants and tress to grow. We can understand the amazing ecosystem of the nature here. Ucluelet promotes “storm watching” for their storm season and I was wondering who would want to see it. When I mentioned it to Philippe, he said he would love it! Later we went to walk the Ancient Cedars Trail, another part of the Wild Pacific Trail. The trail was graveled and not “wild” at all, but it was a wonderful walk in the pristine forest with gigantic red cedar trees. A great day cruising with wonderful skippers, Tobby & Al. Admired the intricate coastline, many small forested islands and also spotted impressive bald eagles, sea lions, otters…. On the way from Ucluelet to Tofino, along the shoreline is the Pacific Rim National Park. There are beautiful beaches surrounded and protected by the dense temperate rainforest. We dropped by at the Long Beach and walked for a while. A Parks Canada personnel earlier told us that the beach might be “crowded” with surfers. 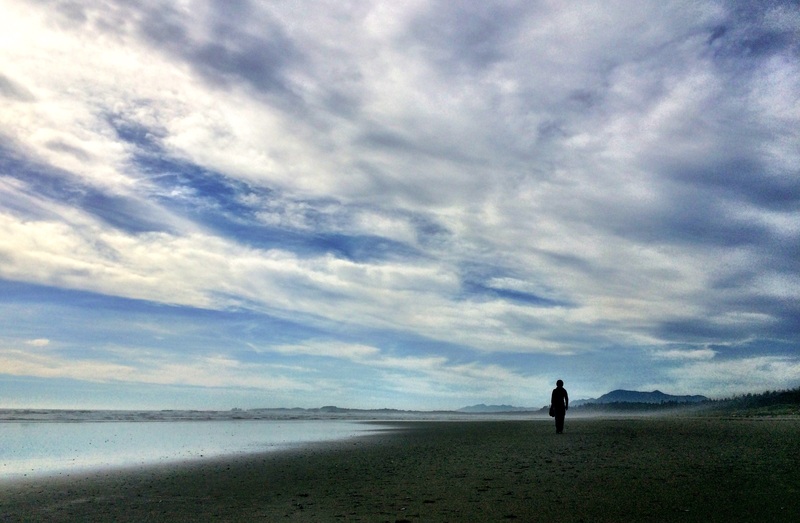 However, it was late afternoon and hardly anyone on the beach. The very wide white sand beach continued endlessly (16km long). Despite the sunny weather the water was apparently around 13 degree and definitely too cold for pleasant swimming. Some surfers were trying out to get on waves and a couple of people were walking, but the further we went, the less people it got and we almost had the beach to ourselves….